This Mini Cooper Gold Portolio: 1961-1971 is a collection of 48 original articles compiled from the pages of Australian Motor Sports, Autocar, Autosport, Car-South Africa, Cars & Car Conversions, Car and Driver, Foreign Car Guide, Modern Motor, Motor, Motor Life, Motor Racing & Sportscar, Motor Sport, Motor Trend, Old Motor, Performance Cars, Road & Track, Safety Fast, Sports Car Graphic, Sports Car World, Track & Traffic, and Wheels. The information collected in these reprinted articles includes 12 on & off-road tests, plus specifications, touring and long-term reports. 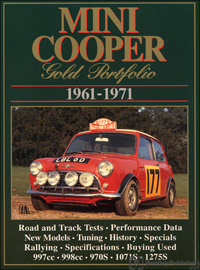 Following the success of the Mini Cooper and of our earlier book on High Performance Minis this latest volume has a wealth of material of interest which fills in the gaps of the last book. Again this book charts the introduction of the models through contemporary road tests and articles. This is a car that is fun to drive, feels quick and has a famous competition history. A large spare parts industry will ensure that these cars stay on the road for many years to come.